Orocan is the most popular brand when it comes to plastic wares and furnitures made of plastic. Of course there are brands that are competing against Orocan in the Philippine local market and that is Zooey. Zooey touts itself as the “maker of quality plastic.” Just like Orocan, Zooey has a wide variety of plastic-made items and one of those items is the Zooey Golden Box. Zooey Golden Box is not actually made of gold nor just a big box. It is a cabinet with six drawers. In the past, when we need a cabinet, all my father has to do is make one. However, now, it is easier to buy a cabinet than to make one. That is why when my mother needs a cabinet, she just went to the palengke (market) and buy her cabinet from the local stores. The price of Zooey Golden Box is around 1,000 pesos but you can haggle with the store owner to lower the price. The plastic cabinets can be used to store many things like clothes, papers, etc. The top two drawers have a lock but can’t be relied upon to secure valuable items because the lock can easily be opened by any item that can fit in the keyhole. 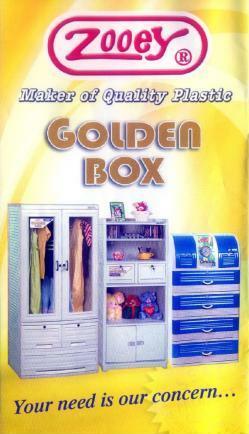 Zooey Golden Box is a fine product but because it is made of plastic, this cabinet is fragile and can be broken into bits. However, if you are a sort of person who are careful then owning a Zooey Golden Box is not a problem. Zooey Golden Box can be bought from the dry section of your local palengke or market. Visit Before the Eastern Sunset and read about the Ramon Magsaysay Part Fruit Store.